Habit: Evolvulus nummularius grows as a creeping herb, spreading and rooting at its nodes. The slightly pubescent leaves are arranged alternately, ovate/rounded/cordate, to 1 cm long and 1 cm wide with an entire margin, a retuse leaf apex and leaf base. The complete, perfect, actinomorphic flowers are solitary in leaf axils. The calyx has 5 unfused, green sepals. The campanulate corolla has 5 fused, white petals. There are 5 functional stamens fused to the base of the corolla and 5 staminodes. The superior ovary with 2 locules and numerous ovules. The round fruit is a many seeded capsule with brown/black seeds. Habitat: Evolvulus nummularius grows in exposed rocky soil, human disturbed areas (fields, roadsides). Distribution in Bahamas/Globally: Evolvulus nummularius occurs throughout the Bahamian Archipelago, the Caribbean region and Central and South America. 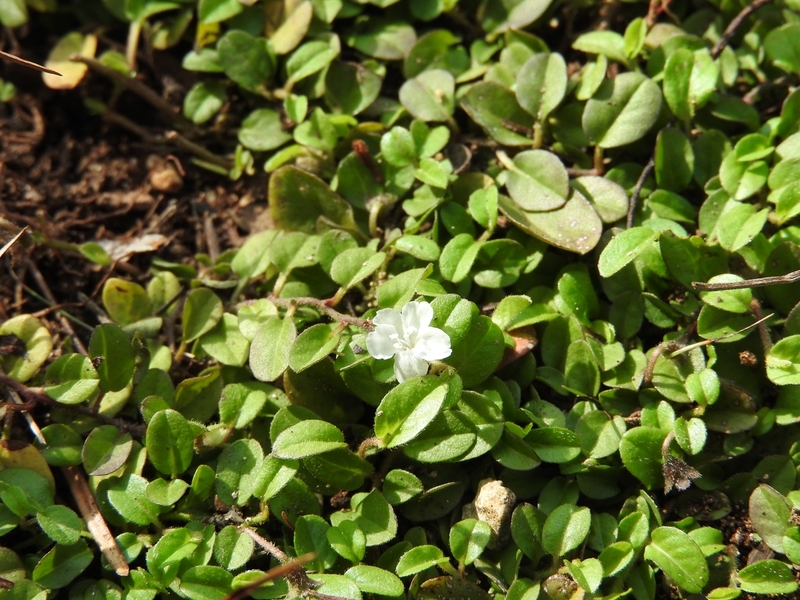 Medicinal/Cultural/Economic Usage: Evolvulus nummularius is not used medicinally in the Bahamian Archipelago.